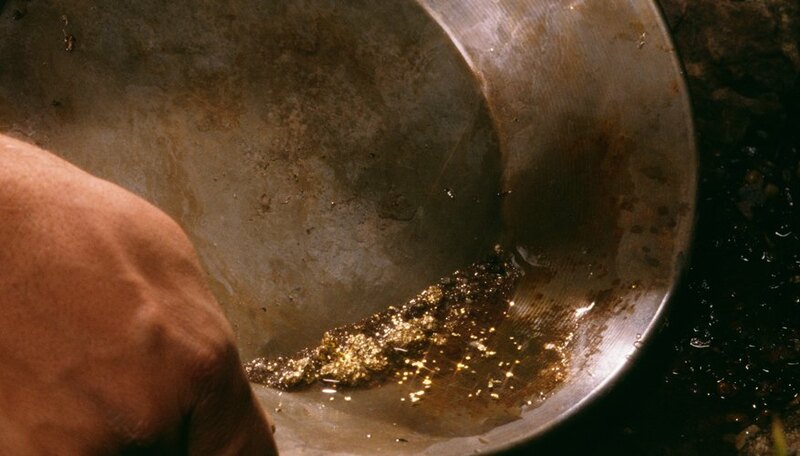 One of the easiest and most inexpensive ways to separate gold from dirt is through panning. This age-old technique has been around since the Gold Rush, and makes a great outdoor hobby that can pay for itself. With a minimum of equipment, the beginner gold prospector can separate gold flakes and nuggets from the surrounding strata in a nearby stream. The supply of gold is virtually endless, as erosion constantly causes hidden gold to be brought to the surface where it is free for the taking. All you have to do is find it. Select an appropriate stream. Either choose a stream on publicly owned land, or ask the private owner’s permission before doing any panning. Quickly moving streams are best, because the clear water prevents sediment from obstructing your view of the gold. The stream should be at least 6 inches deep so you can keep your pan submerged for the majority of the process. Find a promising spot within the stream itself. Sandbars or plant growth on the inside bends are possible places for gold to have washed up with other sediments. You can also determine a promising location by tying small lead weights to inflated balloons with 2 to 3 feet of fishing line, then releasing them into the stream. The place where they settle is where gold is likely to be found. Place the classifier, which looks like a large sieve, on top of your pan. This will keep larger pieces of rock from cluttering up the inside of your pan and make gold nuggets easier to identify. Fill your classifier with loose gravel and dirt using a shovel. Once it is almost full, place the pan and classifier together under water, and move them in a circular motion to allow light sediment to float away and the heavier material to sink to the bottom of the pan. Break up any chunks of dirt or clay with your fingers, being careful not to let any material escape. Leave the pan under running water. When the rocks on top are washed clean, pick up the classifier and sift through it with your fingers for gold nuggets. Gold is easily recognizable by its bright yellow color that glistens in the sun. If there are no nuggets, toss the material in the classifier aside. Stratify the material in your pan by shaking it gently back and forth under running water. The gold will sink to the bottom. Lift your pan so it is partially above the water. Tilt it away from you, being careful to keep the bottom lower than the tilted edge. Water should be able to flow freely in and out of the pan. Using a circular movement from the shoulders down, wash sediment out of the pan, always keeping it submerged except for the side closest to you. Tap the sides of the pan occasionally to help the gold settle on the bottom as you continue with step 8. When there is only a small amount of sediment remaining, rub a magnet inside the bottom of the pan in a circular motion to remove the heavy, iron-laden black sand from the gold, which is not magnetic. Lift the pan further up out of the water for more precision as you shake the pan back and forth to remove the rest of the fine sand. Once the gold has reached the first groove in the pan, remove the pan from the water completely, leaving about 1 inch of water in the bottom of the pan. Tilt the pan repeatedly in a gentle, circular motion to draw the remaining sand away from the gold, which will be concentrated at one edge of the pan. Remove the larger pieces of gold by hand and pick out the flakes with tweezers. Put them in your container. When you have only a small amount of sediment remaining, add 1 or 2 drops of dish soap to break water tension and speed up the process. Don’t look for gold in a privately owned area without first obtaining permission. You could get jailed for trespassing, or even shot if gold claim owners take the law into their own hands. Robin Elisabeth Black is a freelance writer from Fredericton, New Brunswick. She has a Bachelor of Arts and a Bachelor of Education in history, English and math from St. Thomas University and has experience writing in many different genres. Elisabeth, Robin. "How to Separate Gold From Dirt." Sciencing, https://sciencing.com/separate-gold-dirt-8728886.html. 25 April 2017.